LRRbot: Next scheduled stream: CheckPoint+ (Kathleen, Beej and Paul bring you the latest news from the world of Video Games.) at Thu 01:00 PM PDT (4m from now). CodeDancer: Is checkpoint starting in a moment? PhoenixMelior: Chuck is also back from the dead? LRRbot: Next scheduled stream: CheckPoint+ (Kathleen, Beej and Paul bring you the latest news from the world of Video Games.) at Thu 01:00 PM PDT (52s ago). CodeDancer: do I need to refresh the page? TXC2: CheckChuck: is Chuck ok? LRRbot: Next scheduled stream: CheckPoint+ (Kathleen, Beej and Paul bring you the latest news from the world of Video Games.) at Thu 01:00 PM PDT (2m ago). CaptainSpam: I see you've played Checky Pointy before. CastleOtranto: That's not a chat. THIS is a chat. Tuxbeej: My fingers are nice and smooth. PhoenixMelior: Oh, did you get a manicure? Laurence72: Which Beej is this though? Is it Beej, Meej, Threej, or Treej? chi7891: Wait was been replaced by a different part of Threej? LRRbot: Next scheduled stream: CheckPoint+ (Kathleen, Beej and Paul bring you the latest news from the world of Video Games.) at Thu 01:00 PM PDT (4m ago). Tuxbeej: Don’t worry - we are reticulating splines. Tuxbeej: Kathleen and I are seated at the desk and we are beginning final preparations. Creideiki_SE: Talking in chat is part of final preparations? Tuxbeej: I mean, I’m just in here screwing around. Tuxbeej: I don’t need to be here. I just wanted to keep you company. CaptainSpam: Beginning cross-check and all-call? Tuxbeej: And let you know you’re not forgotten. Laurence72: And we appreciate it! Tuxbeej: It’s Paul that’s doing the most. CaptainSpam: The cabin door is closed, all personal electronic devices should now be off or in airplane mode? Tuxbeej: No, don’t put them in airplane mode. You’ll be unable to watch the show. Loonatic93 subscribed with Twitch Prime. They've subscribed for 33 months! Tuxbeej: Ok, I’m outta here. Sit tight! LordChrusher subscribed with Twitch Prime. They've subscribed for 48 months! LordChrusher: 48 months! That's four years! PhoenixMelior: oh boy, I don't even hear audio buzz right now. So smooth. orthiar subscribed with Twitch Prime. They've subscribed for 8 months! teiflingaishling: Im dog walking, so I can’t WATCH, but I can still listen! Konda020946: is this an hour early? azlan121 subscribed with Twitch Prime. They've subscribed for 6 months! Lord_Hydraos subscribed with Twitch Prime. They've subscribed for 5 months! Lord_Hydraos: Beej & Paul have you seen your dank toaster memes yet? Gekyouryuu: may I share with you all a silly thing I made? Serifina: Is Kathleen pretending to be a penguin? mowdownjoe: Why isn't this a podcast? WearingCats_CwC subscribed at Tier 1. They've subscribed for 14 months! CosmicDuctTape: I have a paper I should be writing! LRRbot: The stream has been live for 4:10. Mantafold: audio only is a thing on moble! orthiar: things to pretend to care about is a depressingly accurate description of my job right now. Loonatic93: @LoadingReadyRun I don't normally get to see you folks live. However, work closed early due to yet another SNOWPOCOLYPSE in Minnesota. Seriously, 70 and Sunny one day; two days later... SNOWMAGEDDON!!!!!! orionsrise1: Hey it's video game news time with Paul and Kathleen and Gra.....Beej! kassy_13: aww did i miss it? CosmicDuctTape: @kassy_13 nope! right on time! AgentMagicMaster: Oh! Hands up for those of us in the MN Snowpoloycse! BtEtta: Not all deserts are hot. blast__femur: Spring has sprung here, I don't know if it'll get cold again. Ever. Loonatic93: It's gotten so bad that entire power polls are down. Mantafold: thanks for the MN callout. CamelAttack: Climate change means the a seperation of things that used to combined. All the heat goes one place, all the cold another, all the water in another. Lucaan: On Tuesday, we had 60 degree weather (~15 C) and yesterday we had ice and rain falling from the sky. Asoxa subscribed at Tier 1. They've subscribed for 24 months! koristi_ subscribed at Tier 1. They've subscribed for 48 months! stevestein: Did James write this? CamelAttack: @SalsaDraugur Im not near the ocean, but it will also be in my house, rising sea levels is fun! Bluemage76 subscribed at Tier 1. They've subscribed for 31 months! mynameisie subscribed with Twitch Prime. They've subscribed for 48 months! Wondermoo subscribed at Tier 1. They've subscribed for 68 months, currently on a 68 month streak! blackwlf: As a work from home person, I only put on pants if I'm leaving the house. TXC2: so the LABO is gonna next months challenge on R/GripTraining ? hunkajunk: I mean... I love roasted cauliflower. Serifina: Petting the dog is so good. stevestein: Can You Pet The Dog Gets Results! mowdownjoe: Dog is best item now. LRRbot: The stream has been live for 12:25. PhoenixMelior: Stand up for your beliefs. BloodForTheCorelab: i would pet a lizard!!! accountmadeforants: You can pet the cat if you give the cat a dog mask first. TXC2: can you pet the lizard wizard? Qalten: Are those occasional harsh camera shakes from the construction detonations? A_Dub888: Can I Beej the Beej? Rhynerd: So, Chun Li didn’t die on the way back to her home planet? NathanJay_GA: or a room on shocks, like NORAD? itsastrideh: I mean, Beej does seem more in focus than Kathleen somehow? itsastrideh: Is the lens dirty? TheMerricat gifted a Tier 1 sub to Dog! They have given 234 Gift Subs in the channel! SalsaDraugur: did you guys see the tweet from the fallout 76 twitter where they're selling a gamer chair and all of the replies are pictures of cheap plastic chairs? PhoenixMelior: are they EVER going to be finished blowing up Victoria? ThorSokar: time for some big rubber washers? accountmadeforants: Probably better to find a different mounting spot, mending shake is always hell. Skyboss1996: All their clothes? Even *real pants*?! orthiar: I know it's not exactly news at this point, but I am loving the set since the upgrades. Anaerin: Once more, with focus. LRRbot: Once More with Feeling [WWWW] | Sorcery | Exile all permanents and all cards from all graveyards. Each player shuffles their hand into their library, then draws seven cards. Each player's life total becomes 10. Exile Once More with Feeling. / DCI ruling — A deck can have only one card named Once More with Feeling. Lucaan: I've gotten to the point where I no longer know how I usually say "nuclear"
Gekyouryuu: Kathleen, if you have time later, I made an Obort Zunak card. tagged you with it on twitter. TheWarbo: Does the "nucular" pronunciation tend to also come with pronouncing "nucleus" as "nuculus"? thefileclerk subscribed at Tier 1. They've subscribed for 14 months! LRRbot: LoadingReadyRun has a store! You can buy T-shirts, MTG playmats and sleeves, and much more! Check out https://store.loadingreadyrun.com/ for the full catalog. itsastrideh: Maybe it's an ontario thing that we say it like that? PhoenixMelior: oh, are we just doing a straight do-over? Bladinus: It's Chunk Punch time! TXC2: remember when the Sims had Unions? RassilonDND: is this take two or three for stories? Anaerin: FarleyF What if someone held you up at gunpoint and stole your cup with your face on it. Then you'd be mugged for your mug on a mug. accountmadeforants: The next Sims expansion will completely remove the house-building mechanic. You just lease an appartment with very strict terms. 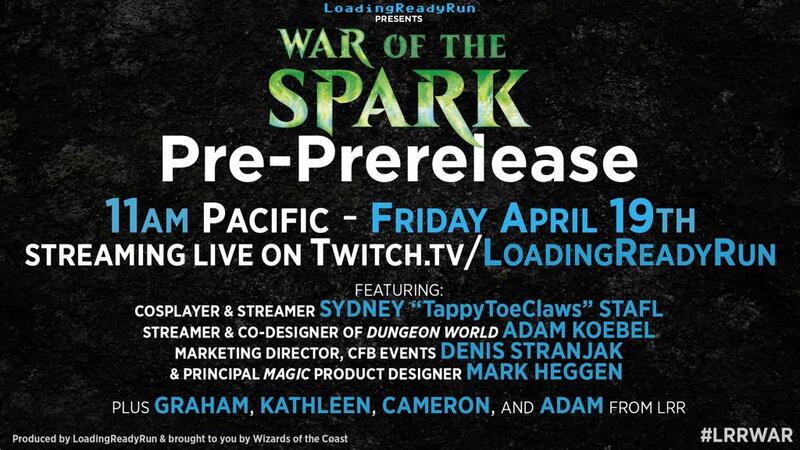 LoadingReadyRun: better focus this time? RWD130 subscribed with Twitch Prime. They've subscribed for 21 months! TXC2: can fallout 76 players feel happiness? accountmadeforants: The Switch's resolution seems like a very poor fit for splitting into two lenses that project its pixels directly at your eyeballs. Anaerin: TXC2 Yes, for only 10,000 Atom in the microtransaction store. colonelkreiner subscribed with Twitch Prime. They've subscribed for 25 months! DigitalSeahorse: Graham did a Beej drop this week! Anaerin: accountmadeforants What, you don't like watching everything through a jail-cell thick screen door effect? Skyboss1996: well, we're redoing that. Raithencore235: Automatic responses... so death? itsastrideh: Can you pet the King Gizzard? AdamYMHMI: I thought the coughs were trying to non-subtly hint at there being some double entendres. Galactic_pain: Can I pet the lizard? Gekyouryuu: off topic, I had an idea: Beach Boys cover band called "Surfboards of Canada"
offbeatwitch: I feel the answer is "only if you ask first"
accountmadeforants: They should at least print that on the inside. miccu_resea subscribed at Tier 1. They've subscribed for 7 months! shadmed subscribed with Twitch Prime. They've subscribed for 28 months! NimrodXIV: the mugs...have a use...? narset6691 subscribed with Twitch Prime. They've subscribed for 14 months! LaconicLad: Who can afford silica gel? orionsrise1: heroquest is at 8pm! NovaTiempo: Ooh, a Serge prank - sneak away his coffee and put a silica packet in ther. Tell him it dried up. Robot_Bones subscribed at Tier 1. They've subscribed for 10 months! An anonymous user gifted a Tier 1 sub to drinkmorewater! teiflingaishling: Imma send y’all throat-coat! ricin subscribed at Tier 3. They've subscribed for 67 months! fuzzy_died subscribed with Twitch Prime. They've subscribed for 27 months, currently on a 27 month streak! accountmadeforants: The Labo thing seems like terrible execution, but something interesting for the future. Anaerin: Isn't the Switch 720p, possibly 720p60? That's not going to be great for VR resolution. BillTheCat: "hey this thing has a gryo in it and a screen on it, why don't we slap some lenses in front of it and call it vr?" Anaerin: BillTheCat Nintendo saw Google Cardboard and say "Good enough!" itsastrideh: If it had introduced a bug, would it have been a flea? Anaerin: itsastrideh A tick, probably. Lucaan: "It's fine, it's just a small change." - Every inexperienced programer before everything goes terribly wrong. Anaerin: Pet the dog while carrying another dog. TXC2: dont most cloths have the brand logo on it? UnboundLaconicity: Is Paul's mic on? fuzzy_died: is Pauls Mic on? orionsrise1: nice four sword shirt Beej! Anaerin: I'm already paying a fortune for this clothing, do I get a discount for being a walking billboard? BillTheCat: if you make an ingame video of your sim wearing those clothes is it moschino-ma? LRRbot: The stream has been live for 3:47:21.
accountmadeforants: Okay, yeah, I found the Kotaku article: https://kotaku.com/moschino-is-releasing-a-sims-inspired-fashion-line-and-1833953091 That's certainly a thing, yeah. KidAmn: "I didn't do anything!" "Explain these market trends only your friends took advantage of." "...I didn't do anything you can prove!" TheGreenMonster450 subscribed with Twitch Prime. They've subscribed for 27 months! Wibbled subscribed with Twitch Prime. They've subscribed for 2 months! Spacecarl: wow this shouldnt be a warning sign or anything! Tochisan7: "I Object!" "why?" "Because it's devistating to my case!" TehAmelie: i've been curious how a lobbyist would be corrupted. would he be giving away more bribes than he's supposed to? Rhynerd: Their clone rights are revoked, their mental data is wiped, their ships are scrapped and recycled, or however you unperson somebody in EvE online. Skyboss1996: "To us, you look like a shitbag, because... uh.. well you are"
MyGrandmasAmazonPrime subscribed with Twitch Prime. They've subscribed for 14 months, currently on a 14 month streak! NovaTiempo: eh, fine I guess? KidAmn: "Here's the only void-element trace rifle in the game... and you *still* can't have it until Sony says so." Skyboss1996: It's your "range queen"
NovaTiempo: wait, are we in the Panalyst lore now? accountmadeforants: That barely sounds like a real sentence. Cmdrlyneye: His point that its exploitative is spot on. ZeroArcana: was harry the one who dressed up as a nazi that one time, or was it his brother? LRRbot: Next scheduled stream: CheckPoint+ (Kathleen, Beej and Paul bring you the latest news from the world of Video Games.) at Thu 01:00 PM PDT (47m ago). Cmdrlyneye: Folding ideas April fools video about fortnite is a really good look at the creepy money side of it..
PMAvers: I mean, it could be worse. They could be playing Magic. Skyboss1996: Hmmm? 25? just to be safe? SpacePotato01 subscribed at Tier 1. They've subscribed for 45 months! SpacePotato01: Just let kids buy Fortnite stuff (and play-hours?) from the store with 'homework tokens'? MousseFilledCat: My nephews do not have access to my brother's wallet, ever. Decaped: 13 year olds will get around nanny software. 11 if they're really familiar with computers. Cmdrlyneye: Morbid curiosity is really good for high "engagement" stuff and children are super susceptible to it. PMAvers: Sounds like it's time to bring back AOL-style internet. accountmadeforants: You're right not to trust it, Google really doesn't care. masta2505 is gifting 1 Tier 1 Subs to LoadingReadyRun's community! They've gifted a total of 89 in the channel! masta2505 gifted a Tier 1 sub to Dragoon14! edgar_j: what paul are you telling me People on the internet are not always telling the truth to me? A_Catastrophic_Success: Back in my day the Internet was made of wood! NovaTiempo: No! Bad vicarious parent! accountmadeforants: THIS BAND IS FULL OF BABIES! traveller800: @accountmadeforants entire team iz BABIEZ!! JohnLockeCole: Oh wow, checkpoint on a thursday, localised entirely on my monitor?? accountmadeforants: Did you talk with them about it? Garfy400 subscribed with Twitch Prime. They've subscribed for 36 months! Loonatic93: The real parental controls. keymaster515: I generally only watch PBS and BBC nowadays. orionsrise1: so Beej as the child has locked out the parents! Tiber727: Eww. I may have issues with Fox, but that really leaves a bad taste in my mouth. TwilightAvalon: Wouldnt Facebook be WORSE than MSM? Hungry_hamst subscribed at Tier 1. They've subscribed for 7 months! Kykiwi: the return of the hero quest! TheMerricat: @Tiber727 Seriously if I thought I could I would to my parents, they retired and went from being kindly 'old folk' to being full on bunker building white supremists in the span of a decade. Texan_Reverend: YES! Hero Quest is back! masta2505: Hero Quest! Wasn't this the first AFK? Sibwow: So is hero quest the longer game? LRRbot: Next scheduled stream: CheckPoint+ (Kathleen, Beej and Paul bring you the latest news from the world of Video Games.) at Thu 01:00 PM PDT (58m ago). Tiber727: @TheMerricat Sorry about that, but I seriously don't think trying to control people is the way to go. aiamethyst subscribed with Twitch Prime. They've subscribed for 20 months! DrDracnon subscribed at Tier 1. They've subscribed for 9 months! accountmadeforants: My grandmas refuse to watch anything but national TV for news, which I've really come to appreciate. TheMerricat: @Tiber727 trying to control yeah, helping them avoid being inducted into a cult because the only human interaction they get now is Fox news... I'm OK with that. zyrconium subscribed at Tier 1. They've subscribed for 64 months! LRRbot: Next scheduled stream: LRRMtG (James and Adam play with Magic Cards. Game: Magic: The Gathering) at Thu 02:00 PM PDT (1m ago). NovaTiempo: Oh, new panalysts soon? PMAvers: Everyone dies. Like, everything. And they have to make a new game. Glodenox: <message deleted>Can a mod please remove this message for testing something on the chat monitor script? Glodenox: Ok, worked perfectly. Thanks! QwertMints: what on magic today? Science_and_Magic: Are those bells in the background? MyClosePersonalFriendJohn: Ever get so used to VODs that you try to skip ahead the live feed... It's nice to catch this live for once. PhoenixMelior: TeamPhoenixDK I mean. I've been here for about five years. TheWarbo: I'm just happy at more ability to yell "STOP MAKING ME DISCARD THINGS"
TeamPhoenixDK: @PhoenixMelior Just rarely looks at chat .-. Raithencore235 subscribed at Tier 1. They've subscribed for 10 months! Raithencore235: Whoop Whoop LRRMTG with my favourite boys! Science_and_Magic: @RassilonDND The fact that the god eternals can't be exiled to stop them for good is scary. Nigouki: so we're gonna get another studio remodeling Loading Time? PhoenixMelior: are we ever getting an updated background? ewalkedaway subscribed with Twitch Prime. m_logan2000: What are we drafting? Cube? Angreed66: What skills I thought only Adam and other Adam have skills. AgentMagicMaster: Hi 2 members of the LRR beard squad! Toshar subscribed at Tier 1. They've subscribed for 34 months! Stoffern: Its not the sound a police car makes? 1losttheGame: what account is this? HungryCavalier: Are you sure this isn't Ben's account? Bobtheninjagoldfish: are you on your own account this time? MyClosePersonalFriendJohn subscribed at Tier 1. They've subscribed for 18 months! MyClosePersonalFriendJohn: Whooo. Time to craft those mines. Wait, it's Thursday... I mean magic those cards. ThirtyCubicFeetOfSalsa subscribed at Tier 1. They've subscribed for 15 months! ThirtyCubicFeetOfSalsa: off work early means I get to catch this live, so here's hoping the heart of the cards finds you or whatever! kinslayer6788 subscribed with Twitch Prime. They've subscribed for 23 months! hunkajunk: Heyyy It's Adam. Hi Adam! SpookySpaghooti: yeah who did build this deck??? Nigouki: so is today going to be a mystery of who built the deck? chesul: so, just looked at today's spoilers, God-Eternals, Yikes. felix__ subscribed at Tier 1. They've subscribed for 40 months, currently on a 40 month streak! martypunker: I'm here because I was told there would be magic tricks. getgudder: What is your guys favorite war of the spark card so far? god boar? Raithencore235: Hey Adam, it's Izoni and old friend! QwertMints: is abzan typically playable? hunkajunk: Splash for Niv Mizzet! accountmadeforants: I propose you keep Portcullis Vines as the deckbox art even if you're not running it. It looks sweet.